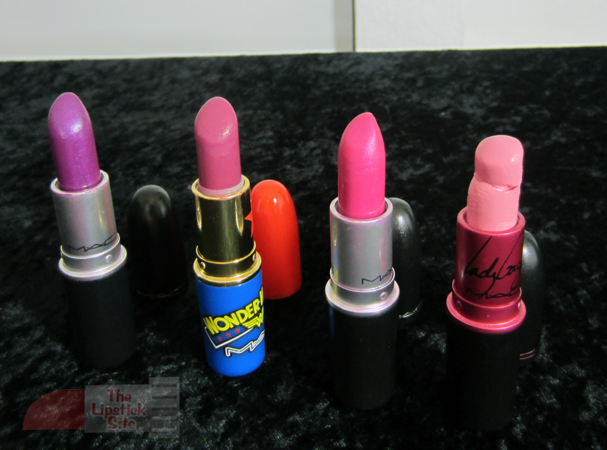 I have more MAC lipsticks than I do of any other brand. This is mostly because they have such a wide array of colors, they are fairly inexpensive, and because they come out with really fun limited edition sets (the Wonder Woman Collection, the Venomous Villains Collection, and the Marilyn Monroe Collection, to name a few). It will take me a while to photograph and write about all my MACs, so I will do it in chunks, in between reviewing other brands. 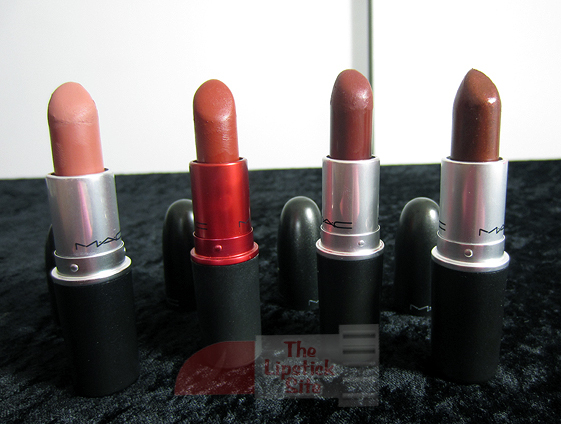 Some of the MAC lipsticks I review have been discontinued, but a lot of the time you can still find them at Amazon, where resellers still have extra stock. I’ll start with some of my more earth-toned colors. 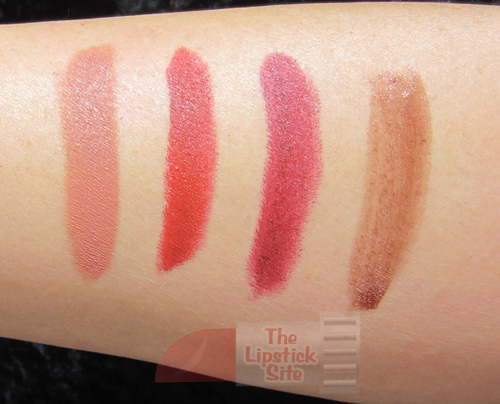 From left to right: Velvet Teddy, Viva Glam I, Charred Red, and The Prowl. Out of the above, Viva Glam I is definitely my favorite. It is a nice, somewhat neutral matte red, and it goes with pretty much any outfit. Velvet Teddy is a tad light for my taste, but I can imagine it being very flattering on someone else, with a bit of liner in maybe a shade darker. Charred Red is good for goth days. And although I like the name, I am definitely not a fan of The Prowl. Really odd consistency, and the color just isn’t flattering on me. And now, to contrast all of that earthliness, here are some pinks and purples! From left to right: Violetta, Satin Spitfire, Show Orchid, and Viva Glam Gaga. I absolutely *adore* Violetta. Pictured above is my second tube, being that I used my first one down to a sliver. It is the prettiest violet shade I’ve ever worn, and goes on so smoothly. I do think that Violetta is one of the discontinued colors, which is unfortunate. Satin Spitfire is part of the limited edition Wonder Woman set, and I am also a big fan of that one, as I am of Show Orchid. Finally, Viva Glam Gaga is really pretty for a very light shade, which is why I keep it, despite its- -ahem- -condition. What I find a bit odd about MAC lipsticks is that the texture isn’t always consistent. 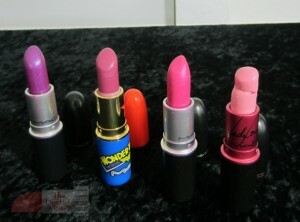 Some of their lipsticks feel dry whereas others feel more creamy. It could be that some of the lipsticks I get are simply newer than others, which would explain the issue. You can probably gather that I am more of a fan of the bright colors than the brownish ones, so my opinion is probably a bit biased in that way. I do love reds, though, and my really red MAC lipsticks are reserved for a future blog entry. More soon; thanks for stopping by! 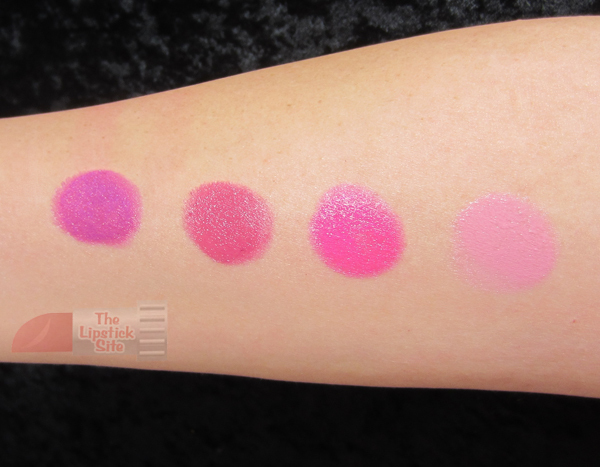 This entry was posted in Lipstick Reviews and tagged lipstick blog, Lipstick Reviews, lipstick swatches, MAC, MAC lipstick, MAC reviews, makeup blog by . Bookmark the permalink.